Protein extraction is an essential sample preparation step in proteomics. Proteins can be extracted from plant and animal tissue, yeasts and microorganisms. Sonication is a reliable, efficient protein extraction method giving high protein yields within a short extraction time. Protein extraction from tissues and cultured cells is an essential sample preparation step which is performed during many biochemical and analytical techniques such as ELISA, PAGE, Western blotting, mass spectrometry, or protein purification. Ultrasonic cell disruption, lysis and extraction is a precisely controllable technique to ensure high yields of proteins. For the preparation of whole-sized tissue (e.g. kidney, heart, lung, muscle etc. ), the tissue should be dissected into very small pieces with clean tools, on ice preferably, and as quickly as possible to prevent degradation by proteases (e.g. lysis buffer such as RIPA or hypotonic lysis buffer containing protease and phosphatase inhibitor cocktail). After dissecting, the sample is immersed into liquid nitrogen for snap freeze. 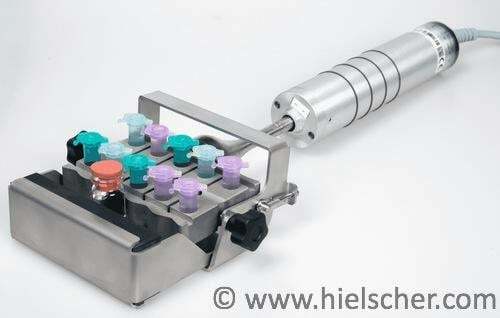 The sample can be stored at -80°C for later use or be keept on ice for immediate homogenization. Immediately before ultrasonic extraction, ice cold lysis buffer (with protease inhibitors DTT, leupeptin and aprotinin) is rapidly added into the sample tube (per ~10 mg of tissue approx. ~600 μL of buffer are recommended). Approx. 20-60mg of tissue is recommended per sample tube. Ultrasonic homogenization, lysis and extraction is performed with an ultrasonic homogenizer such as the UP200Ht or UP200St, equipped with an micro-tip sonotrode. Sonication duration is 60-90 sec. at an ultrasonic cycle mode of 15 sec. sonication and 10 sec. resting time. The sample should be kept in ice all the time. After ultrasonic homogenization / extraction, the lysate is centrifuged at 27,000g for approx. 20 min. Afterwards the supernatent is collected, so that the protein concentration can be determined by a protein assay such as Pierce protein assay BCA. 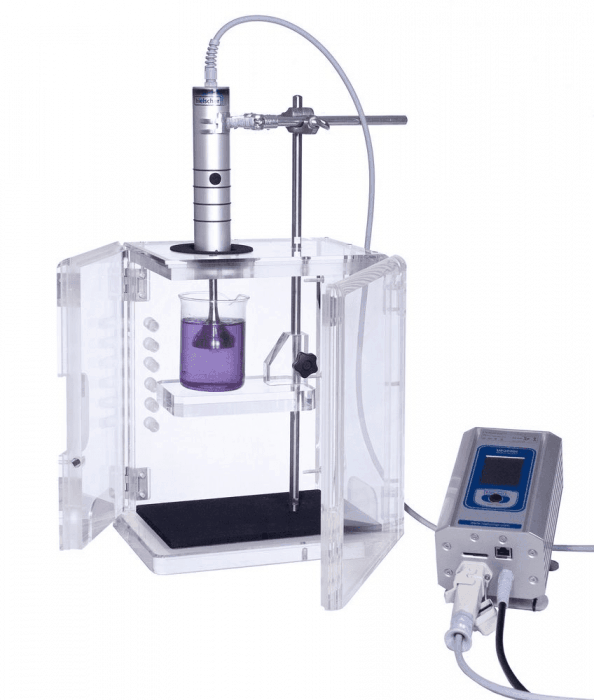 For a homogeneous mixture of the serum and the phosphate buffer, the sample is vortexed first before ultrasonic cell lysis. For the ultrasonic lysis, the sample is sonicated with an ultrasonic lab homogenizer such as the UP100H for 8 cycles at 20% amplitude, for cycles of each 5 seconds on and 15 seconds off. 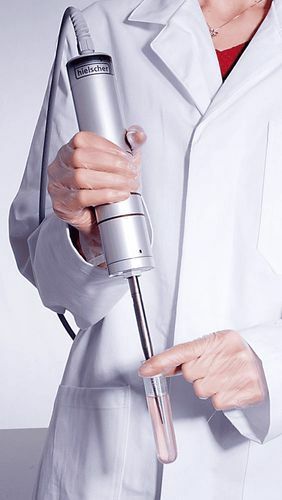 Sonocation is carried out by sonicationg in cycles and by placing the sample on ice so that an overheating and thermal degradation of the sample is avoided. Since serum contains a large amount of high molecular weight proteins (such as albumin, α1-antitrypsin, transferrin, haptoglobulin, immunoglobulin G and immunoglobulin A), which interfere with the separation of low molecular weight proteins during IEF, it is recommended to deplete them from the serum using a depletion column. Fresh, soft plant tissue, e.g. moss etc., can be easily disrupted by simply placing the chopped sample material in lysis buffer for sonication. Tough, ligenous plant tissues, such as seeds, fir needles etc., should be ground dry. Some hard, woody plant materials must be frozen and ground in liquid nitrogen before extracted by sonication. For plant cell culture suspensions, an ultrasonic treatment between 30 and 150 seconds in a lysis buffer is mostly sufficient. Tougher material such as pumpkin seeds require a more intense sonication as described below. For the ultrasonic protein extraction of albumin from fine-ground pumpkin seed powder, 10 g of defatted pumpkin seed powder and 100 mL of deionised water as solvent are added in a 250mL glass beaker. The protein extraction consists in two steps: First, the sample is sonicated with a probe-type ultrasonicator UP400St (400W, 24kHz) with mounted sonotrode S24d7. The glass beaker is placed in a cold water bath during the ultrasonic homogenization. The the setting of the ultrasonicator UP400St with the plugable temperature sensor ensured that the sample temperature is always kept below 30°C. By the precise temperature control during sonication, a denaturation of albumin is avoided. Secondly, extraction was performed with an mixer at 200 rpm speed and at 30°C. Afterwards the beaker is transferred into a thermostatic shaker. Globulin is removed via dialysis with distilled water. After the globulin removal, the protein extract can be sampled for determination of the albumin profile and is subsequently adjusted to pI=3.0 using 0.1 M HCl for albumin coagulation. The solid phase is separated by centrifugation at 5000g, 20°C and redissolved in deionised water. Albumin coagulation is performed twice to increase the protein ratio in the albumin concentrate. Ultrasonic alkaline protein extraction for the preparation of protein concentrate from rice bran shows that the ultrasonic treatment results in higher protein yield in a significantly shorter extraction time – compared to conventional extraction methods. To obtain fully functional iNOS enzyme (e.g. for drug screening), the following protocol is recommended: The cell suspension should be placed on ice and sonicate with an UP100H at 10µm amplitude at cycle mode of 5 sec. sonication and 25 sec. rest on ice. The procedure should be repeated approx. 3 times. The resting time in between sonication cycles reduces the temperature rise and will therefore reduce the risk of denaturation. Sonication may accelerate the protein solubilization process, which usually requires several hours. In order not to overheat the sample and prevent protein degradation and modifications in solutions containing urea, the ultrasonic bursts should not last longer than few seconds. Temperature control: To ensure a high protein yield without thermal denaturation, temperature during extraction must be controlled. Hielscher’s state-of-art ultrasonic homogenizers – also called ultrasonic disintegrator or sonificator – are precisely controllable. They come with a plugable temperature sensor. In the setting options of the ultrasonic homogenizer, a maximum temperature can be set. When this temperature max is reached, the ultrasonicator automatically stops until the sample has cooled down. Buffer: The choise of a suitable buffer and the right volume of buffer varies from tissue to tissue and must be figured-out by trial-and-error testing. Isolation / purification: Protein lysates can contain an excess of biomolecules such as DNA or carbohydrates, which may be removed by protein precipitation (deoxycholate-trichloroacetic acid) or buffer exchange. Chittapalo and Noomhorm (2009) reported that protein yield increased using sonication and that the ultrasonic tissue homogenization and lysis process can enhance existing extraction processes significantly – enabling for new commercial extraction opportunities. Hielscher Ultrasonics offer a broad range of ultrasonic homogenizers for the disintegration of cells, tissues, bacteria, microorganisms, yeast, and spores. 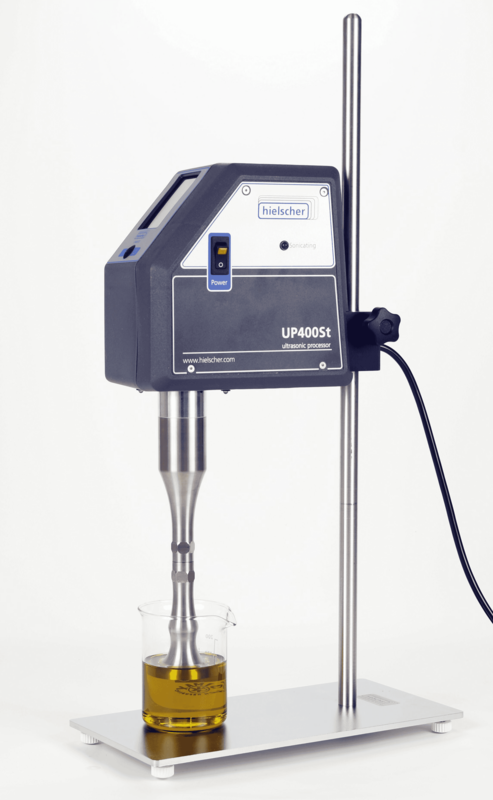 Hielscher lab ultrasonicators are powerful and easy to operate. Built for 24/7 operation, they are designed as robust and efficient lab and bench-top devices. 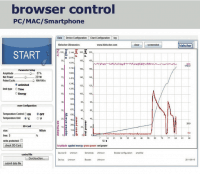 For all devices, the energy output and the amplitude can be precisely controlled. The broad range of accessories opens further setup options. The digital devices such as VialTweeter, UP200Ht, UP200St, and UP400St have an integrated temperature control and an built-in SD card for automatic data recording. For the indirect, cross-contamination-free and simultaneous sonication of multiple samples, we offer the VialTweeter or the ultrasonic cuphorn. Depending on your application, material, and sample volume, we will recommend you the most suitable setup for your sample prep. Contact us today! Chittapalo T, Noomhorm A (2009): Ultrasonic assisted alkali extraction of protein from defatted rice bran and properties of the protein concentrates. Int J Food Sci Technol 44: 1843–1849. Simões, André E.S:; Pereira, Diane M.; Amaral, Joana D.; Nunes, Ana F.; Gomes, Sofia E.; Rodrigues, Pedro M.; Lo, Adrian C.; D’Hooge, Rudi; Steer, Clifford J.; Thibodeau, Stephen N.; Borralho, Pedro M.; Rodrigues, Cecília M.P. (2013): Efficient recovery of proteins from multiple source samples after trizol or trizol LS RNA extraction and long-term storage. BMC Genomics 2013, 14:181. Proteomics is the research field that investigates proteins and the proteome. Proteins fullfil a vast array of vital functions within organisms. The proteome is the entire set of proteins expressed by a genome, cell, tissue, or organism at a certain time. The proteome varies with time and distinct requirements, or stresses, that a cell or organism undergoes. More specifically, it is the set of expressed proteins in a given type of cell or organism, at a given time, under defined conditions. The term is a blend of proteins and genome. Proteomics is the study of the proteome. Proteins are are large biomolecules, so-called macromolecules – which are composed from one or more long chains of amino acid residues. Proteins are present in all organisms of both vegetal and animal origin and they are crucial for most of the biological functions. Since proteins contain a lot of biological information, they are extracted for analytical purpose, e.g. for proteomic research. The most important function performed by proteins include the catalysis of metabolic reactions, DNA replication, response to stimuli, and the transport of molecules from one location to another. Proteins differ from one another primarily in their sequence of amino acids, which is dictated by the nucleotide sequence of their genes, and which usually results in protein folding into a specific three-dimensional structure that determines its activity. Proteins are – besides peptides – one of the key components of food. Therefore, proteomics is a powerful tool in food science to optimize processes, food safety and nutritional assessment. Gel electrophoresis is the major method for separation and analysis of macromolecules such as DNA, RNA and proteins as well as their fragments, based on their size and charge. It is used in clinical chemistry to separate proteins by charge and/or size (IEF agarose, essentially size independent) and in biochemistry, molecular biology and proteomics to separate a mixed population of DNA and RNA fragments by length, to estimate the size of DNA and RNA fragments or to separate proteins by charge. Cell culture is the controlled growing process by which cells are cultivated under controlled conditions. Cell culture conditions vary for each cell type. In general, the environment of a cell culture consists of a suitable vessel (e.g. Petri dish) with substrate or medium that supplies the essential nutrients (amino acids, carbohydrates, vitamins, minerals), growth factors, hormones, and gases (CO2, O2), and regulates the physio-chemical environment (pH buffer, osmotic pressure, temperature). Most cells need a surface or artificial substrate, whilst other cell cultures can be cultivated free floating in culture medium (suspension culture, cell suspension). Mass cultures of animal cell lines are used in industrial production of viral vaccines and other biotechnologically derived products. Human stem cells are cultured to expand the number of cells and differentiate the cells into various somatic cell types for transplantation purposes. The term tissue describes a cellular intermediate, where the cell material is on an organisational level between cells and a complete organ. In tissue, similar cells, from the same origin that together carry out a specific function, are assembled. By the functional grouping of multiple tissues, the complex structures of organs are formed. Tissue is sampled for research in biology, histology/histopathology, parasitology, biochemistry, immunohistochemistry as well as to cultivate and extract DNA. It can be distinguished between animal (subdivision: mammal tissue) and plant tissue. Animal tissues are grouped into the four basic types of connective, muscle, nervous, and epithelial tissue. Plant tissue is subdivided into the following three tissue systems: the epidermis, the ground tissue, and the vascular tissue. Tissue samples can be prepared from animal or plant parts, e.g. bone, muscle, leaves, etc. Blood, serum, plasma, cerebrospinal fluid, saliva and synovial fluid are body fluids, which offer a great source of diagnostically relevant information. Therefore, a sophisticated preparation of body fluid samples for analysis is important. The first difficulty is associated with the broad dynamic range of components present in body fluids. Bradford assay, Lowry assay and bicinchoninic acid (BCA) assay are common assays to determine the concentration of proteins. Bovine serum albumin (BSA) is one of the most frequently used protein standard. Lysis buffer must be choosen in accordance to the cell material or tissue (tissue culture, plant, bacteria, fungi, etc. ), and whether the cells are in a structure and the type of structure. A wide range of lysis buffers for extraction of proteins, membranes, and organelles are formulated with one or more detergents. The detergent is usually selected via trial-and-error tests or – if available – according to an existing protein extraction protocol. The detergent must be compatible with the tissue source and the proteins. In general, the mildest detergent that works for a specific tissue / protein, is chosen in order to maintain the maximal functionality of the extract. Furthermore, in case of an extraction of membranes and organelles, a mild detergent keeps the membrane intact. Commonly used detergents in lysis buffers are mostly nonionic or zwitterionic, e.g. CHAPS, deoxycholate, Triton™ X-100, NP40, and Tween 20. For instance, tissues such as brain, liver, intestine, kidney, spleen etc. can be simply buffered with RIPA – however protease inhibitors and DTT (e.g. for gel electrophoresis) should be included. Table of common buffers and their pH range. In general, these buffers are normally used at concentrations of 20-50 mM. TRIzol is a chemical solution used to extract RNA/DNA/protein during the guanidinium thiocyanate-phenol-chloroform extraction. The use of ultrasonically assisted TRIzol extraction results in high DNA, RNA, and protein yields from the same sample and excels thereby other extraction methods.